There's a feature at 6084A which EW has approx. doubled (Olivier also has it), and the 3A difference to 6087 is suspicous (basic features don't have any shift). And, a NEW feature has appeared at 6106A (both the features easily confirmable by human look on all the 3 x 30 minute raw frames). Calibration is rock solid: 11 lines (continuous), RMS=0.003603 (2 order, one line has 0.008, all the others <= 0.003). Heliocentric correction was not applied for this star (according to default db rules, to my understanding). Congratulations to Woody and Peter for their spectra ! After an uncertain weather throughout the afternoon of September 7th, the sky finally cleared at the end of the day (as expected...) and I was able to also resume tracking Vend 47 ! 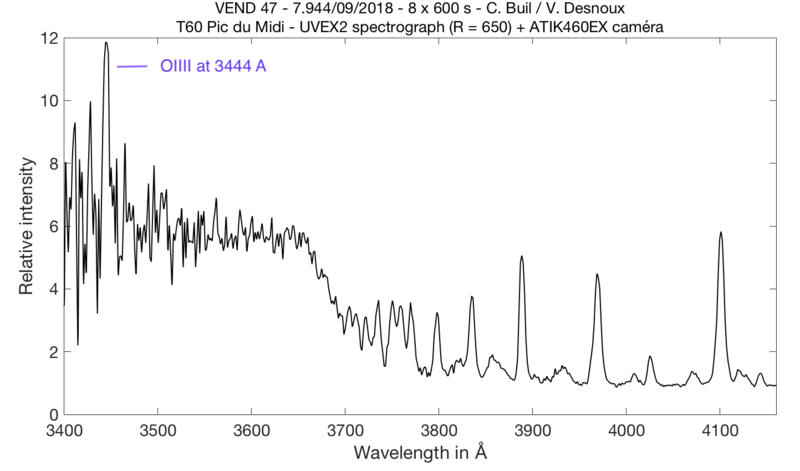 I obtained the following spectrum at 21 h 16 TU with a resolution of 506 (JJ = 2458369.412) and an acquisition time of 60 min. 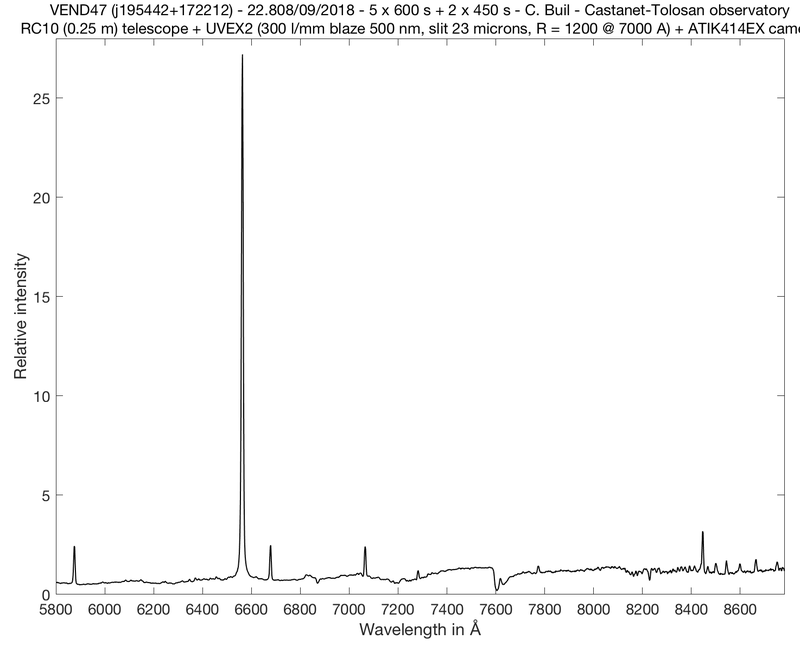 The comparison of the spectra always shows a clear increase in the relative intensities of the Balmer lines. The relative intensity of the HeII line at 4686A still seems unchanged since August 25, as well as those of the HeI lines at 6678A and 7065A. 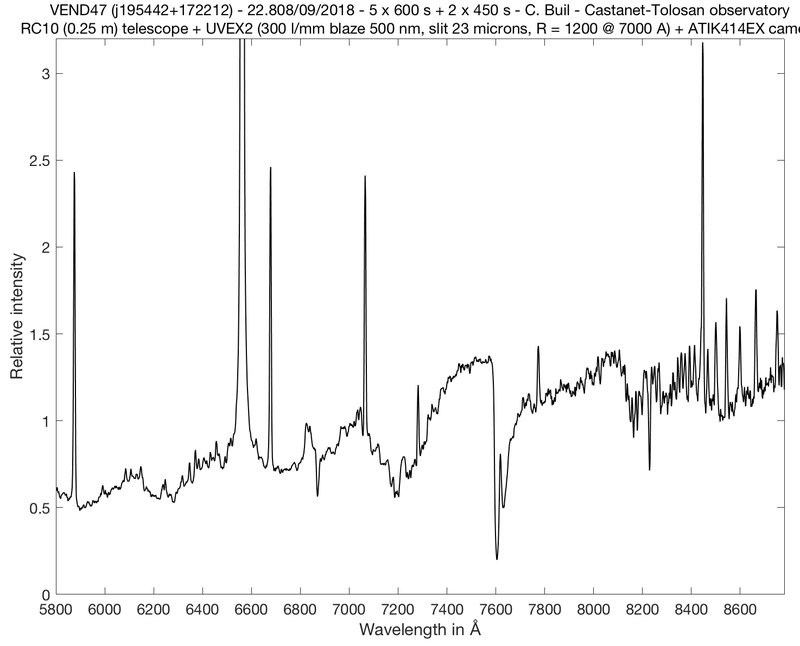 I also detect something at 5721A and 6087A but that does not seem conclusive to me at low resolution since these "lines" are already visible in my previous spectra. The continuum seems to evolve significantly at short wavelength…? 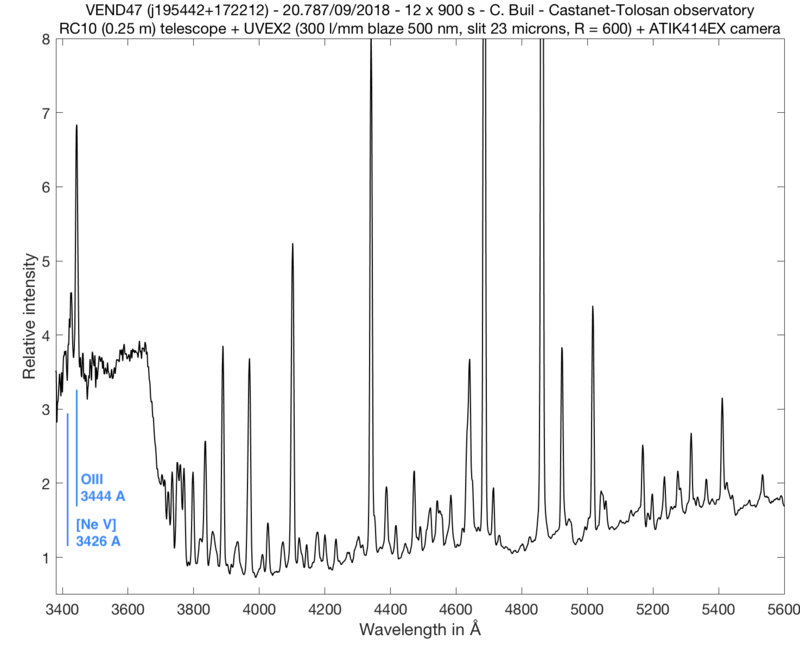 However, I think I have also detected the OIV Raman line at 6826A. ...and the [OIII] lines at 4363, 4959 and 5007 are always undetectable at low resolution. Note that this feature is a hard target at this medium resolution, due to the high magnification factor required to acquire the real details. Christian, it's always impressive to see the spectrum of Vend47 in the near UV area ! Have you noticed any changes from your August 26 spectrum in this spectral region? on September 11 at 21 h 39 UT with a resolution of 504 (JJ = 2458373.4235) and an acquisition time of 60 min (12 x 300 s). on September 15 at 21 h 51 UT with a resolution of 505 (JJ = 2458377.4319) and an acquisition time of 60 min (12 x 300 s). The relative intensities of Balmer lines are always increasing. Peter, very interesting...I hope you can follow the evolution of this structure ! 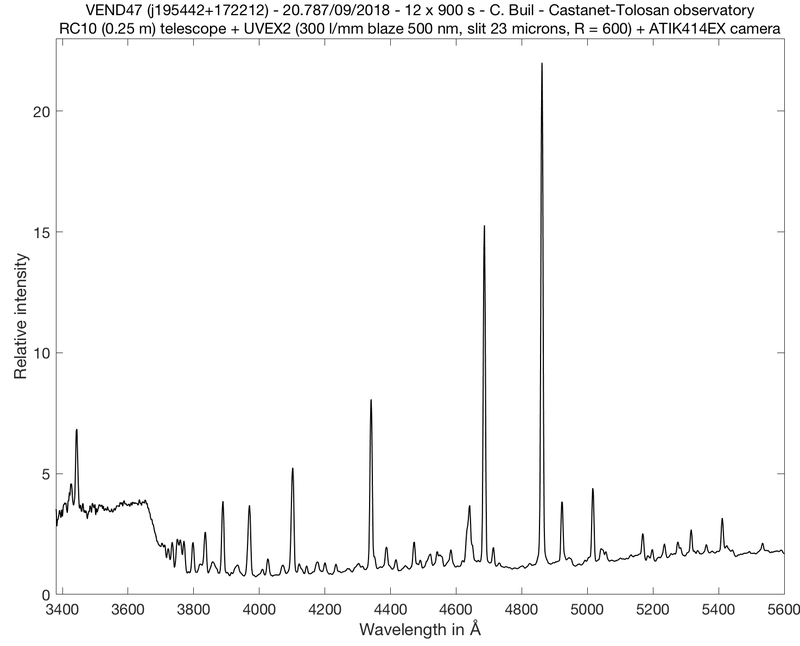 I also detect (but with a much lower resolution ...) a double peak for the position that corresponds to the Raman OIV line at 6826A. This one seems to evolve since September 7th (to follow...). on September 25 at 21 h 53 UT with a resolution of 509 (JJ = 2458387.4258) and an acquisition time of 40 min (8 x 300 s). on September 28 at 21 h 51 UT with a resolution of 507 (JJ = 2458390.4231) and an acquisition time of 35 min (7 x 300 s). First, I note that the relative intensity of the line [OI] at 5577A appears to be increasing since September 15th. Second, a structure appeared in the area near the [FeVI] line at 5677A. Did someone notice something similar?